Henry is retired but still active at BPRC. His expertise is in application of standard photogrammetric and surveying techniques to glaciology, such as studies of the extent and motion of glaciers and ice sheets. 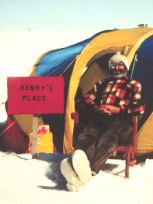 He has conducted many years of field work in polar and glaciated mountain regions in both hemispheres and continues to enjoy opportunities to do so even after a 50-plus year "career".